Rambles in the Air | A Blog about Aviation, Books, History, and my interest therein. Well this is exciting. I’ve written a lot about B-29s before and about 44-49972 Doc on a few occasions. I saw it gleaming over in the distance when I visited the wonderful Kansas Aviation Museum a couple of years ago. Now it appears that the aircraft is actually accessible to the public in its new dedicated hangar. Apparently you can visit the airplane (admission prices are all on the site) on Tuesdays, Thursdays and Saturdays each week starting on March 12 when Doc isn’t on tour. I think I know where I’ll be going when the Kansas weather improves. 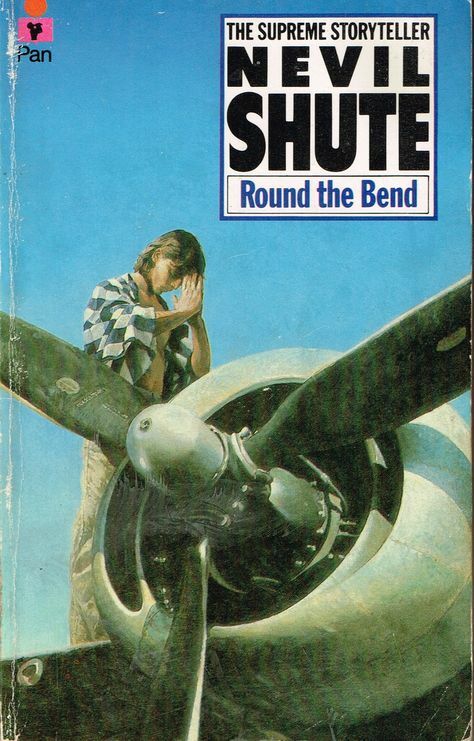 Every so often I like to say something in this blog about a favourite aviation book, and Nevil Shute’s 1951 novel Round the Bend certainly qualifies as a favourite. I’ve read a few Shute novels before (and since, and I’m still missing a few) but this one along with A Town Like Alice, ranks among his best works, in my opinion. It is said that Shute himself regarded Round the Bend as his finest novel. Cover image (by George Sharp) of the Pan Paperback edition of Nevil Shute’s Round the Bend. I have no idea when this edition was published although the cover price of 2.50 GBP might give some indication. 🙂 It seems that George Sharp used the Twin Wasp installation on a B-24 as his reference for the mechanic praying for guidance before commencing work. From this small start he builds an air-freight business, servicing the burgeoning oil industry in the Arabian Gulf. While delivering a load to Indonesia, Cutter encounters an old friend from his days in Cobham’s Flying Circus. Constantine “Connie” Shaklin has had a varied career in aviation as a ground engineer in the United States, Canada and Thailand, but most recently been working for an American gun-runner and mercenary who supplies arms to Indonesian rebels fighting for independence from the Netherlands. At the time of their meeting, the gun-runner has been shot down and is awaiting imprisonment. Cutter recruits Connie and acquires the gun-runner’s remaining aircraft. Connie is something of a mystic with eclectic religious interests. Even as a British Citizen of mixed Chinese and Russian ethnicity, he starts bringing the tenets of the Koran (and later the words of Buddha) into the maintenance shop. The standard of work in the hangar improves dramatically, and word of the “New Maintenance” spreads from Bahrein to Karachi, across the Indian sub-continent and into Thailand and Indonesia. Is a religion or is it simply quality control using religious principles? Various of Shaklin’s followers have their own views. Cutter is interested to see that Muslims and Buddhists are able to see Shaklin’s wisdom and even to a small extent to worship or meditate together, as he and his Sikh Chief Pilot also do at different stages in the book. Along with a few others around the Web I’ve spent some time trying to identify some of the thinly disguised (and some undisguised) aircraft which appear in the narrative. Some, like the Fox Moth, Dakota and Liberator (to name but three) are not renamed or disguised either because they do not affect the narrative structure sufficiently or would detract from the narrative is they were renamed. I smiled when Tom Cutter mentioned “a new thing called an Airspeed Ferry” when reminiscing about Alan Cobham’s Flying Circus. Airspeed Ltd. as the reader may know, is the company that Nevil Shute Norway co-founded with Cobham serving as a director, so it’s charming in a way that Shute couldn’t resist the temptation to name-check one of his own creations. After the Fox Moth, the next aircraft Tom Cutter wants to acquire is a Basing Airtruck, which appears to most observers to be a thinly disguised Miles Aerovan. I’ve been racking my brain trying to see what the connection is between Basing and the many iterations of Miles Aircraft, and one day I’ll come up with something plausible. The Aerovan first flew in 1945, and only 52 were produced over the two years or so that it was in production. One example was even acquired by the Israeli Air Force and used for a month in 1948 before it was destroyed. In the novel, Cutter acquires two Airtrucks for his business. I like to think this is the “Cornell Carrier” from Round The Bend – Curtiss-Wright C-46 “Commando” of First Nations Transportation, seen in 2006/2007. (Public Domain by Bzuk via Wikimedia Commons). The next aircraft that Tom Cutter acquires is a Cornell Carrier, which formerly belonged to the American gun-runner. The true identity of the Carrier has been something of a mystery. It’s not a Dakota, sine they crop up by name throughout the novel. We learn it’s a large American aircraft with twp big Pratt and Whitney engines, and that Tom Cutter had never dreamed of getting one since they were outside his league . I’ve read a couple of comments on the Web that the Carrier must be a Fairchild C-82 Packet, but I’m not convinced. I would suggest that the real identity of the Cornell Carrier is the Curtiss C-46 Commando, if only because it shares the same initials as the Cornell Carrier. Despite being demonized by some of the upper echelons of the US Army, the C-46 was produced in large numbers (around 2100 built), many of which found their way into civilian use and several of which continue to be used to this day. In the novel, Cutter’s business expands across the East to the point at which he needs to acquire yet another large freight aircraft. The aircraft he wants is a Plymouth Tramp, since he can’t get another Carrier. The Tramp, he says is a large aircraft and the British counterpart to the Carrier although a little easier to load. The acquisition lands him in trouble with the British community in Bahrein (all except the oil company, that is) since one of the local sheikhs makes him an interest free loan for religious reasons. So, what does a Plymouth Tramp look like? To me, it’s not too much of a geographical and semantic stretch to get from “Plymouth Tramp” to “Bristol Freighter.” First flown in 1946 and in production between 1946 and 1958 (and in use for longer than that) it seems the logical choice for a heavy lifting freight aircraft of the type needed by Cutter’s airline in the late 1940s and very early 1950s. I have a few personal memories of making Airfix models of Bristol Mk.32 Superfreighters as a boy, and in fact I found a few pieces of one of them in my modelling spares box the other day. Those clamshell nose doors were always a big thing for us. See the picture below. There is much more I could say about the book, including the locations and political background. Some of the attitudes of postwar Britain suffuse the narrative. The character of Tom Cutter is unusual in that he rejects the casual imperialist line of the British Empire and finds that by using local labour, and local or Asian aircrew, he can make a considerable profit in his business. I read an article years ago which named a British aviation entrepreneur who was said to be Shute’s model for the character of Tom Cutter, although I can’t find it at the moment. Cutter’s purpose in writing the book, he says, is to record his interactions with Connie Shaklin, and consider his own role in helping Shaklin spread his knowledge and philosophy. The nature of Shaklin’s philosophy, and the nature of Shaklin himself is one of the bigger questions, and honestly, it’s worth reading the book to find out more. Have I mentioned the Meteor before? I ought to look through the annals of this blog but I don’t honestly think I have. My friend Paul Bird the architect used to talk about form following function when we were students together, and to a certain extent the early jet aircraft were expressions of that philosophy. The Meteor is another of those iconic aircraft shapes which I associate with my childhood, or youth, and I do remember being excited when Airfix and Frog released their models of the F.3 and F.4 respectively. The reason for this particular ramble is that my sister Hilary referred me to a UK news item about the retirement of an airworthy Meteor night-fighter at Bruntingthorpe over the weekend. I still haven’t worked out which one it is / was although there can’t be too many contenders. I have a feeling it must be NF.11 / TT.20 WM167 but I’ll be happy to be proved wrong. I am struggling to remember if I’ve ever seen a Meteor flying around. I did take a photo of a very rusty example stored on the outer fringes of Duxford airfield in the early 80s. It was either F.4 VT229 or F.4 VT260, both of which are preserved in the USA. There was a Javelin next to it, if I recall correctly. So that got me thinking. Where are the oldest Meteors located? I know I’ve seen the prototype DG202/G at Cosford, and someone on Wikipedia is at great pains to point out it’s the prototype F9/40 and was never actually called a Meteor. OK, fair enough, but after that? Meteor F.4 EE531, noted at the Midland Air Museum located at Coventry Airport near Baginton, Warwickshire. If you’re going to be strict about the F9/40, then this is the oldest complete production Meteor in the UK. Meteor F.4 EE549 at the Tangmere Military Aviation Museum (on the site of the former RAF Tangmere) Chichester, W. Sussex. EE549 was the “Star Meteor” which set the world absolute speed record of 616 mph on 7 September 1946. Meteor F.4 I-027, ex-EE527, Museo Regional Interfuerzas, Santa Romana, San Luis. Four digits senior to EE531 at Bagington, this is in my view the oldest complete production Meteor extant. Meteor F.4 I-025, ex-EE532, displayed on plinth on the Avenue of the Air Force, outside the Escuela de Aviación Militar, Córdoba. Meteor F.4 I-019, ex-EE553, displayed on plinth at the Northern Roundabout of the Avenue Spinetto Santa Rosa, La Pampa. Painted as I-021, condition poor. Meteor F.4 I-014, ex-EE575, displayed on plinth in Goya, Corrientes. Meteor F.4 I-038, ex-EE587, Junin Aeroclub, Junin, Buenos Aires. Meteor F.4 I-041, ex-EE586, Museo Nacional de Aeronáutica de Argentina, Morón, Buenos Aires. Meteor F.4 I-031, ex-EE588, Either at the Liceo Aeronáutico Militar de Funes, Funes, Santa Fe, or Aeroclub Las Parerjas, Las Parjas. Wouldn’t you know it. Kermit Weeks has Meteor F.4 N229VT, ex-VT229 under restoration or at least in storage at Fantasy of Flight, Polk City, FL. Meteor NF.11/TT.20 WD592 is at the Air Force Flight Test Center Museum, Edwards Air Force Base, CA. We then come to the issue of bits of old Meteors. I tracked down a couple in the UK just as I thought I’d finished writing this article. The Imperial War Museum has what it describes as a cockpit section of F.3 EE416. This aircraft was delivered to Martin-Baker in November 1945, and it was from EE416 that the very first live ejection test in the UK was carried out on 24 July 1946. The LRO was launched in June 2009 and actually started delivering images in the Fall of 2009 (on September 15, 2009, which is as auspicious date for the Brits among us). Its primary mission was anticipated to be just one yea, with a science mission of 2 years. It’s had two 2-year mission extensions and is still active nine and a half years since launch. To say my friend Gary Allman is pretty good with a camera is like saying Yehudi Menuhin could play the fiddle a bit. Standard J-1 at the NMUSAF, October 2018. Gary visited the National Museum of the United States Air Force. Envious, moi? But of course. However, I knew he would bring back a number of terrific images and he has not disappointed. I scooted through the Early Years gallery way too quickly when I was there in 2002, so some of his photos are a revelation especially in the light of recent studies. In the Cold War gallery I was amused and interested to see the B-57 Canberra lurking behind the F-104 and F-106. I don’t remember seeing it before, but I was in complete sensory overload by the time I got into this area of the museum. I had no idea, but now I know, the F-106 on display (58-0787) is the so-called “Cornfield Bomber” which landed sans pilot in a Montana field in February 1970. The trainee pilot had ejected after the aircraft went into a spin, and for whatever reason the force of his ejection caused the aircraft to right itself and make an uncontrolled soft landing in the field, which advantageously happened to be covered in snow. February in Montana? Yes, I would say snow cover would be quite likely. The aircraft was repaired and returned to service. The museum acquired the aircraft in 1986. I just noticed by the way that the F-104C (56-914) in Gary’s pictures has roughly the same scheme and appearance as the example used in the Star Trek episode “Tomorrow is Yesterday” which was the subject of a recent blog post. I haven’t been to Dayton for more than 15 years and a few things have clearly changed. The new fourth hangar now houses the Presidential and research aircraft collection. This saves a bus ride with an armed guard across Wright-Patterson AFB which was a little edgy back in the day. A few of the odds and ends which I was telling Gary about before his visit seem to have been removed from display. Whether this is long-term or short term given the collection shuffling that occurred when Memphis Belle was installed is another question. I certainly enjoyed finding, and gibbering at, the tail of B-17G 42-97683 and the engine and other artifacts recovered from B-24D 41-24301 Lady Be Good when I was there. The Museum certainly looks much more spacious although Gary said that a number of artifacts were pretty crammed in there. It was a very enjoyable experience looking at those photos. Sometime I hope to go back there again myself. It seems appropriate to use a title from Star Trek for my first post of the new year. Happy New Year to the readership, by the way. It’s good to have so many of you along. It’s no secret that my experience in the class at PSU in which I sat last semester rekindled my desire to build a few models. I honestly promise I’m not going to turn this blog into Adventures in Plastic, although the last three posts have had a distinctly modelling feel. Today I was getting my PowerPoints and other online materials ready for the new semester which starts on January 14th. It was much less painful than I was expecting (I admit I haven’t tried to merge my PowerPoints with any for the revised textbook yet) so I thought I’d do a little bit of online window shopping. I think I said before there are a few aircraft shapes which I find entrancing, including the Spitfire, BAC (English Electric) Lightning, TSR.2, and T-38. I may have also mentioned that the F-104 does something for me too, and I haven’t had a model of a Starfighter since I was quite young. So while idly perusing the pages of the web I found it strangely pleasing to see that, a couple of years ago, some enterprising (groan!) executive had paired an F-104 with the Enterprise itself to recreate the episode “Tomorrow is Yesterday. ” If you look it up you will see it’s the nineteenth episode of the first season of Star Trek. I was pleased to see it was written by the wonderful Dorothy (D. C.) Fontana, and was first broadcast in January 1967. I won’t go into the plot details here since you can pretty much deduce them from the kit box. I remember watching the episode several times over the years. The fact that we’re approaching the 52nd anniversary of its broadcast is something to note. Meanwhile I’m going back to those other pages and see if there is a decent F-104 to be picked up at a reasonable price.